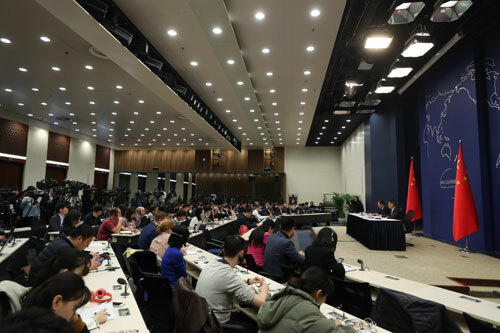 On March 20, 2019, the Ministry of Foreign Affairs held a briefing for Chinese and foreign media. 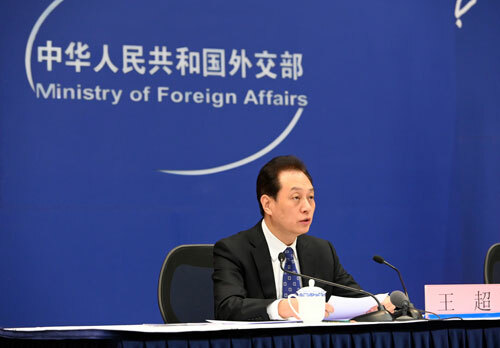 Vice Foreign Minister Wang Chao introduced relevant situation of President Xi Jinping's upcoming state visits to Italy, Monaco and France and answered questions from journalists. Wang Chao pointed out that at the invitation of President Sergio Mattarella of the Republic of Italy, Head of State Prince Albert II of the Principality of Monaco and President Emmanuel Macron of the Republic of France, President Xi Jinping will pay state visits to the above three countries from March 21 to 26. President Xi Jinping's visit to Europe will be the first overseas trip in 2019 by the Chinese head of state, also the top leader of the Communist Party of China, bearing historic significance for the development of China-Italy, China-Monaco and China-France relations. Wang Chao noted that Italy is an important member country of the G20 and the European Union (EU). This year marks the 15th anniversary of the establishment of comprehensive strategic partnership between China and Italy, and next year will mark the 50th anniversary of the establishment of diplomatic relations between both countries. Development of bilateral relations faces important opportunities. President Xi Jinping's visit to Italy will be of historic significance in building on the past and opening up the future for the bilateral relations. During his visit to Italy, President Xi Jinping will hold talks with President Sergio Mattarella and Prime Minister Giuseppe Conte, meet with presidents of the Senate of the Republic and the Italian Chamber of Deputies, and the two sides will exchange in-depth views on China-Italy, China-EU relations as well as international and regional issues of mutual interest. Both sides are willing to further strengthen the comprehensive strategic partnership to present the latest development level of China-Italy relations and give new epochal connotation to China-Italy cooperation. President Xi Jinping and Prime Minister Giuseppe Conte will jointly witness the signing of intergovernmental cooperation documents in fields of diplomacy, economy and trade, and culture, as well as commercial agreements in infrastructure, machinery and finance. The two sides will further strengthen cooperation under the joint building of the Belt and Road Initiative and strive to bring more tangible benefits to the two peoples. In addition to Rome, the capital of Italy, President Xi Jinping will also visit Palermo, the capital of Sicily. Monaco is a European country with distinct charm as well as unique international influence in the fields of environmental protection, culture and sports. Since the establishment of diplomatic relations between China and Monaco, the two countries have adhered to the principle of mutual respect and equal treatment, constantly deepened political mutual trust, and enjoyed unique practical cooperation, setting a good example for friendly exchanges between countries of different sizes. President Xi Jinping's visit to Monaco, the first-ever one by a Chinese president, will be of historic significance to bilateral relations. President Xi Jinping will hold talks with Prince Albert II during his visit to Monaco and they will exchange in-depth views on issues such as politics, economy, humanities and environmental protection, and jointly open up a new era of the development of China-Monaco relations. France is a permanent member of the United Nations Security Council and an important and major EU country, as well as the first major Western country to establish official diplomatic relations with the People's Republic of China. The current China-France relations have maintained sound, stable and high-level development, which go beyond the bilateral scope and have distinct strategic, contemporary and global characteristics. The two countries have made steady progress in cooperation in jointly building the Belt and Road Initiative and third-party market cooperation, and constantly score new outcomes in cooperation in the fields of nuclear energy, aviation and aerospace, agriculture, finance and sustainable development. The two sides have also maintained close coordination in safeguarding multilateralism, improving global governance and dealing with climate change, and witnessed increasing people-to-people and cultural exchanges. President Xi Jinping's state visit to France, after an interval of five years, will coincide with the 55th anniversary of the establishment of China-France diplomatic relations, and is of special significance to bilateral relations. During his visit, President Xi Jinping will hold big-scale and small-scale talks and small-scale banquet with President Emmanuel Macron, meet with Prime Minister Edouard Philippe, Speaker of the Senate and President of the National Assembly. The leaders of the two countries will exchange in-depth views on China-France relations, China-EU relations, and international and regional issues of common interest, and witness the signing of cooperation agreements covering energy, transport, agriculture, finance, culture and technology. 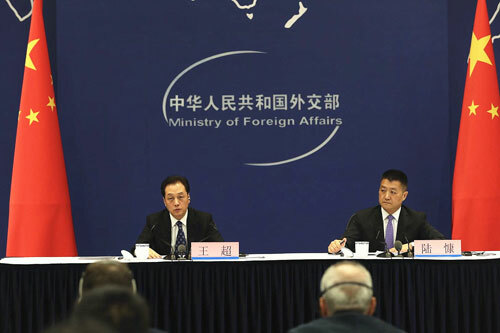 Wang Chao stressed that it is believed that President Xi Jinping's visits will bring the practical cooperation between China and the three countries to a new height, inject new impetus into China-EU relations in the new era, open up new space for jointly building the Belt and Road Initiative, bring more benefits to the people of China and Europe and make new contributions to world peace and development.